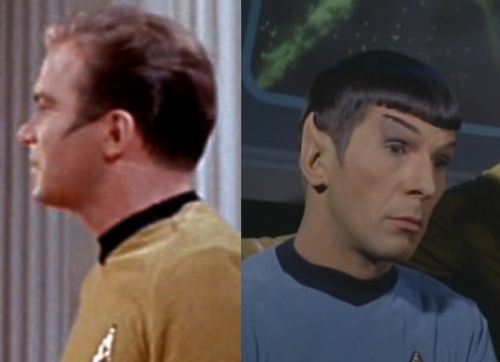 In Star Trek, characters generally have pointy sideburns. Clearly a production decision was made in the 60s. What's the history of this? There is a section on this in "The Making of Star Trek", by Stephen E. Whitfield. According to the story, the producers (that was basically Gene Roddenberry) wanted 'futuristic' hairstyles. However the actors pointed out that they had to live in the real world, and weren't going to spend their off days looking like freaks from the future. The pointed sideburn was the compromise. There isn't a record of exactly who came up with the idea. Presumably some combination of Roddenberry and the hair department. In Leonard Nimoy's autobiography I am Spock, near the end of Chapter 2, Nimoy claims that he had the idea for Spock alone to have the pointy sideburns, but that they later gave them to everyone. An interesting sidebar: I had suggested pointed sideburns as a specifically Vulcan look for Spock. Apparently Vulcans are intergalactic trendsetters, because you'll notice everybody in the Federation now sports those pointed sideburns. This does suggest that pointed sideburns were Nimoy's idea, but this could still be in-line with the Gustav Mendoza's claim that his father Richard Mendoza came up with the style for Spock, and Nimoy approvede and suggested it be just for Vulcans. Or possibly they came up with the idea together. Gustav does say that Richard came up with it for Spock, not the entire crew who later sported it, so that part is now from two sources. Gustav Hernandez claims that his father, Richard Hernandez, a hairdresser for Lucile Ball (and one of the first male Hollywood hairdressers), designed the pointed sideburns for Spock. The thing that took the thorn out of my paw really was Leonard, because I was so pleased for him, and I knew this was going to give him some liquidation, that he could then do what he really wanted to do. And I was very pleased with all of that. And I had come up with the pointed sideburns. And a few other things. But that, very specifically. Is there any in-universe explanation or reference to why pointy sideburns persisted for so long? Why was R2D2 in Star Trek? Are there any people of Indian descent in Star Trek? Out of universe, why was Wesley Crusher included in Star Trek: Nemesis? Why are characters in Star Trek so specific when speaking?